Cliff Mass Weather and Climate Blog: Can You Get More than 100% Solar Energy? The Answer is Yes! Can You Get More than 100% Solar Energy? The Answer is Yes! More and more folks are putting up rooftop solar panels here in the Northwest. And some of them are getting results that seem bizarre. Take the case of Ted Weiler of Kenmore, WA, who sent me a note that other day wondering why he sometimes gets higher peak solar output from his panels during partly cloudy days than clear ones. Here is a plot he sent me for his system output for a few days during the past week. 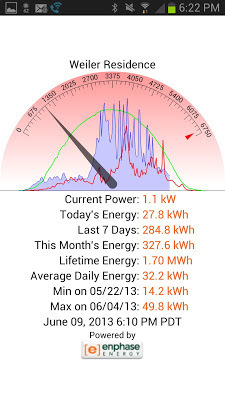 The green line shows the power produced on June 4, a day that was nearly clear. Nice cosine shape. The blue line/area shows the output on June 9th, a partly cloudy day---something very strange is going on! At some times the solar power output was GREATER on the partly cloudy day than on the clear day. How could that be? And an even cloudier day is shown with the red line...even THAT day had a period with greater output than the clear day. Can this be right? 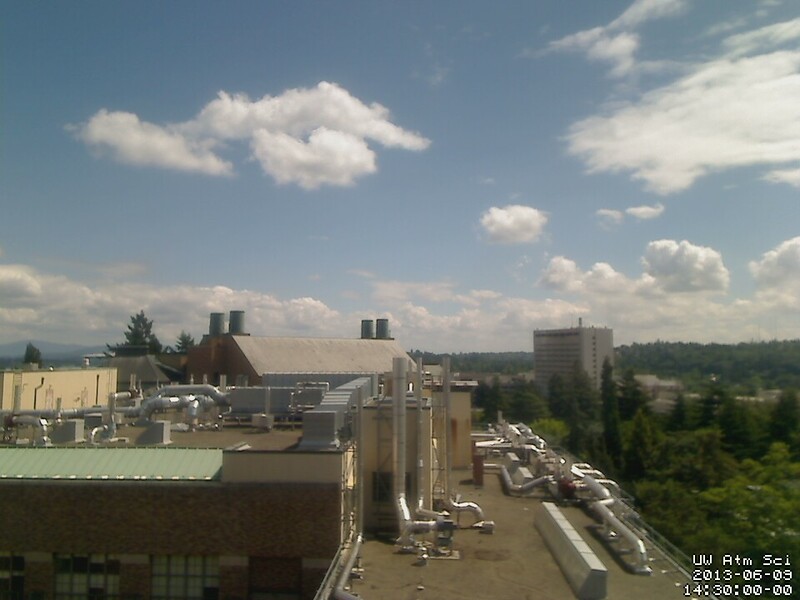 Lets check the solar radiation measured on the roof of the atmospheric sciences building at the University of Washington. First, lets look at the amounts on June 3, 4, and 5 (the times are in GMT/UTC, so they are offset 7 hr from PDT). June 4th, the middle one, almost looks like a perfect cosine. The 3rd and the 5th had some clouds. But wait! Look carefully and you will see that the partly cloudy days had some spikes (associated with clouds) that had peak values greater than the clear day. Ted Weiler might be on to something! Let's check out a different trio of dates (June 6, 7, and 8). You can see the spikes above clear sky values again! What is going on? The answer is obvious if you think about it. 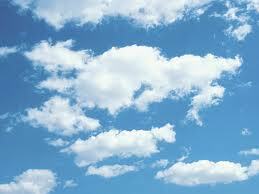 On partly cloudy days, we have periods with breaks in the clouds when you get direct solar radiation from the sun. But you ALSO get solar radiation that is reflected off nearby clouds...solar radiation that is not getting to someone else because the cloud is intercepting it. So you start with the clear-sky value direction from the sun, but you are also getting the radiation reflecting off clouds....the sum is clearly more than the clear sky value. Here is the view from the top of my department at 2:30 PDT on June 9th. It was partially cloudy at that time, and you can see some of the bright clouds that were giving the direct sunlight an extra boost. Although you might get a boost above clear skies values for a short while, inevitably the direct solar radiation will get blocked by a cloud--thus, your total power output will be less than the clear sky total over the entire day. If you can find a way to stay in the direct sun, while clouds surrounded you and never blocked the sun...you would have a really sweet situation. My god, I know such a place. 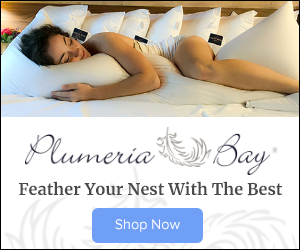 !..it is known as Sequim and its famous "blue hole." No wonder so many California retirees are heading there, solar panels in tow. This sounds like a question for the Architecture school at the UW. A rooftop array, surrounded by "solar" sails that raise, lower and adjust to reflect a maximum amount of additional light on to the panels over the course of the day. 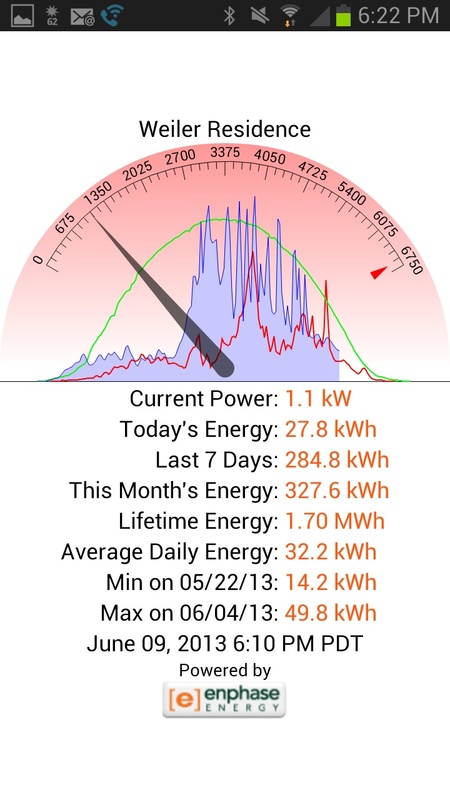 The benefit of more power from an existing array of PV panels. Also keep in mind that the cooler a solar panel is, the more output it'll produce. When a solar panel is shaded from the sun via partial clouds, then suddenly be faced with full sun (and reflected light) it'll be much cooler than it would have been if had been sitting in direct sun all day. These situations cause panel output to occasionally exceed their rated capacity. Note also that partial shading can drop the output of a panel by far more than the amount of solar radiation that's blocked. If your panels are partially shaded by vegetation, it's entirely possible to get higher output on a lightly cloudy or overcast day independent of the effect that Cliff describes. Cliff's explanation is not completely accurate. On partly cloudy days, the spikes in solar energy received on the ground are caused by the refraction of the direct solar beam by particles at the edges of clouds. At cloud edges, the particle density is not great enough to attenuate the solar beam, while the particle size is such that it can refract the direct solar beam forward. Thus solar energy that would ordinarily be scattered into space is instead "focused" forwards, down to the ground. 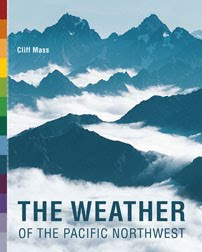 This effect can be seen in direct beam measurements (as opposed to hemispherical measurements which would include the scatter off clouds that Cliff talks about). Temporal spikes must be due to the refraction of the direct solar beam through cloud edges; long term enhancement would be due to scatter off clouds. On a somewhat related note, our hot water panels are shaded (unfortunately around noon) for a couple of hours by an enormous poplar tree in our neighbor's yard. On clear days the panels cool enough during this shady period for the controller to shut off the flow of water through the panels. On all but the most heavily clouded days the panels continue to output even during what would normally be the shady period of the day. Presumably this is due to a combination of the cloud dispersing the light hitting them from above while they simultaneously improve the back-radiation scenario on the ground. Interestingly enough it's also possible to tell from the system data logger when clouds arrive or depart during the night; the panel temperature is strongly dependent on whether there's a more or less clear path to space. Panel temperature become crazy low during the dead of winter, often 15-20 degrees cooler than the air temperature. My understanding is that thin wispy cloud cover filters out low energy photons (i.e. longer wavelengths) and the extra energy in the higher wavelengths is captured better. Although the temperature doesn't affect the amount of solar energy a solar panel receives, it does affect how much power you will get out of it. As the solar panels get hotter, they will produce less power from the same amount of sunlight. The main effect of temperature on solar panels is that it reduces the efficiency of the solar cells at converting solar energy (sunlight) into electricity. One other issue to consider is the effective area of the panels. When you are looking at them at a 90 degree angle (say noontime), you are seeing the full panel area. When you are looking at them from more of a sideways angle, the panel area appears smaller. On a bright white day, in the morning and afternoon, the sky at a 90 degree angle to the panels has more light than on a clear blue day. Thanks for the solar panel efficiency blog.Every big MNC'S now a day doing solar sysytem on their roof. bcoz of it they gets lot of electricity. thanks for sharing this Efficiency information with us. our Solar panel system company will also trying to do this better.